This summer boot is my favorite pick from Sorel's spring collection. 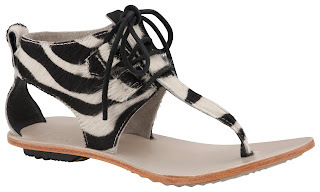 The sandal/boot hybrid is inspired by Sorel's 1964 Pac boot, mixing fashion and function in a stylish zebra print. The soft leather footbed conforms to your foot for a fit that gets comfortable with every wearing. Along with rubber outsole pods for a no-slip grip, it's the perfect choice for walking around the city and can be worn with jeans, shorts, skirts or dresses. The summer boot retails for $130 at sorel.com and is available in sizes 5-12. One reader will win a pair of the Sorel Summer Boot. To enter, leave a comment on this post stating what you would wear with the Sorel Summer Boot. No purchase necessary. Void where prohibited. Must be legal U.S. resident, 18 yrs or older to enter. Contest ends on March 14th, 2012 at 11:59pm ET. Fashionably Petite will determine (1) one winner, who will be awarded one pair of the Sorel Summer Boot. Limit one prize per household. Odds of winning are dependent on the total number of eligible entries. Retail value of prize: $130.00. Winner will be contacted by email. Offer valid while supplies last. Giveaway sponsored by Fashionably Petite; Prize provided by Sorel. Decisions, decisions. I would wear the Sorel Summer Boot with some black skinny jeans, a flowy top and stacks of bracelets on my arm. What a unique "boot"! I would wear them with some white flowy linen pants and a colorful blouse on top! Perfect for running errands on a summer weekend. I would wear this unique boot with a nice pair of dark skinny jeans and a turquoise blouse. Or, to switch it up I would pair these shoes with a pair of white shorts and a nice simple shirt to make the shoes speak for themselves! I'd wear them with a pair of skinny jeans cuffed at the bottom, an asymmetrical white tank in a flow-y material, and a cropped moto jacket. I did all 5 of the bonus entries also! 3) Like fashionably petite on Facebook/Valerie C.
5) Like Sorel on Facebook/Valerie C.
Super cute! I would wear them with white or colored skinnies or maybe a lbd for evening walks around town! I would wear this summer boot with a white jean skirt and black flowy top. I would keep my outfit simple and let these zebra patterned beauties catch all the attention! Love! I see myself wearing them all summer with sun dresses, shorts and flirty maxis..they are so versatile! Thank you for the chance to win them!! And the winner is.....Kaumealani! Congratulations! Please email me at kim@fashionablypetite.com so I can get your info to have your summer boot sent out! Thank you everyone for entering. Stay tuned...I have another great contest coming up soon!